This year, the theme of the Day, February 13, is: "Dialogue, Tolerance and Peace". As we are Radio too, we will celebrate again, but our way, being on the air with the special callsigns: AO1WRD, AO2WRD, AO3WRD, AO4WRD, AO5WRD, AO6WRD, AO7WRD, AO8WRD and AO9WRD; for just over a week: from Friday 8 to Sunday 17. The aim of UNESCO devoting one day to Radio, is to enhance a mass media, simple and low cost, specifically suited to reach remote communities and vulnerable people. The day should be also a good opportunity to think over and to value the media and the task performed in the development of society. Radio amateurs, as a subcategory within the Radio and of a huge interactivity, have our own role and contribute to keep alive the technical knowledge of equipment and behavior of waves. In this activity, Federación Digital EA offers the possibility of operating the special stations to its members and gives special QSL to a single contact, which is also valid for the Radio Clubs of the World Award, EANET . During these days, they will be on the air using the different bands and more usual modes (phony, CW, digital, etc.). A good way to locate them is through DX Cluster and/or also consulting the agenda of the activity. As a suggestion, the call may be in English: "CQ CQ CQ ... this is AOxWRD, special event station in occassion of World Radio Day", or in Spanish: "CQ CQ CQ ... de AOxWRD, estación especial con motivo del Día Mundial de la Radio". This year the activity will start at 00:00 h EA 2019-02-08 (23:00 h UTC 2019-02-07) and end at 23:59 h UTC 2019-02-17 (00:59 h EA 2019-02-18). 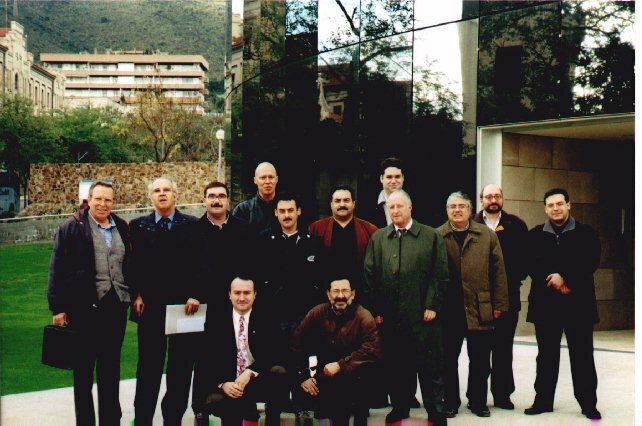 Asistentes al Congreso SYSEA'99 de Barcelona en la UPC.